In the aftermath of President-elect Trump’s victory, many employers are wondering how the president-elect’s priorities will impact their employment and labor law obligations. One immediate question on employers’ minds is whether they still must comply with the Obama administration’s new federal overtime pay rules set to go into effect on December 1, 2016. It is highly unlikely that there will be any activity related to these rules by President-elect Trump prior to the December 1 deadline, although a later retraction or retrenchment of the rules is certainly possible. Employers should, however, stay tuned to a legal challenge to the new rules currently pending in federal district court in Texas. The judge in that action, Judge Amos L. Mazzant, III, has announced that he will rule by November 22, 2016, on a pending motion to enjoin the U.S. Department of Labor’s enforcement of the new rules. If the court grants the motion and issues a nation-wide injunction, implementation of the new overtime pay rules may be delayed. However, because the court could also deny the motion or limit the reach of any injunction, employers should continue preparing for the December 1 deadline. If the new federal overtime rules go into effect on December 1 as scheduled, “white collar” executive, professional and administrative exempt employees will need to be paid a gross base salary of at least $913 per week ($47,476 annualized) to remain exempt from overtime requirements under federal wage and hour law. In addition, the total annual compensation required for an individual to be classified as a highly compensated employee will increase from $100,000 to $134,004. The new rules also provide for automatic increases to these new salary requirements at various pre-set dates in the future. 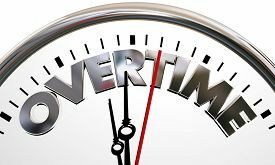 The legal challenge to the new overtime rules began earlier this fall when 21 states and a number of business groups sued the U.S. Department of Labor in federal district court in Texas in two separate cases that have been consolidated. This week, the court heard oral argument on the plaintiffs’ motion requesting an injunction barring implementation of the new rules. Among a number of arguments, the plaintiffs allege that the U.S. Department of Labor has exceeded its legal authority in issuing the new rules and providing for automatic salary threshold increases in the future. The plaintiffs also argue that the extraordinary measure of injunctive relief is necessary to halt the rule and preserve the status quo until the court can fully hear the merits of the case. We here at GPM will be continuing to follow the Texas case and will provide an update when the court rules next week. In the meantime, employers should continue to prepare to comply with the new rules, given that the December 1 deadline may hold.